The Westalee program has been great for many folks, and we have even more to offer now using the quilting rulers with the special ruler foot on your flatbed sewing machines, with free-motion stitching. The Westalee Basics class gets you started with the rulers as you learn to maneuver and manipulate your designs. 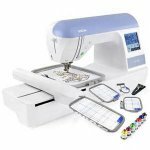 A must for new embroidery machine owners, or those wanting to renew or perfect their skills. This is a workshop class to teach the basics of threads, stabilizers, needles, hooping, placement and stitching on a variety of fabrics. This is a fun but "workhorse" class. Machine owners that purchased here pay $25, others are $50. Jane and Jeannie love to bind--and they will share several techniques for finishing off those quilt edges or other project finishes in this workshop class. 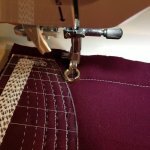 You will learn to cut and join strips, apply front and back as you stitch on sample squares, including "back to front" techniques and curves. 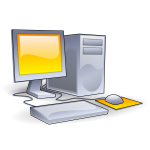 This is a computer class geared to helping you with your design files, transferring files, unzipping, downloading, writing to USB, saving and more. If you need help just managing your embroidery designs-this class will help you! This gathering is for anyone who loves to be around sewing, quilting, embroidery, machines, notions and "sew" much more. We gather the first Saturday of each month and the Friday before the first Saturday. Jeannie and Jane share new patterns and notions, fabrics and great new ideas and techniques. Sometimes there is a special challenge to participate in, and there are lots of door prizes! We do "show and tell" so that members can share their projects--it is wonderful and fun. Our main service project is to bring pillowcases for Cook's Children's Hospital, but we also donate to the Linus Project. We hope you will join us--everyone is welcome. We take a $5 per session donation to help with the handouts and door prizes--and everyone gets a fat quarter on their birthday month! We try our best to offer classes for many of our machines, and offer free group classes for those purchased here in several categories. If you have questions about your machine, please take a look at the basic classes offered or call the store for help. Machine owners who did not purchase here may pay to take these classes. Review of the basics of this economical software with an emphasis on the additions that you can make. If you are "thinking" about adding a software program to your embroidery but don't want a larger investment--take a look at this one. Note--we are considering offering classes on some of the add-ons to Embrilliance if there is interest--(such as Enthusiast and Alpha Tricks)--let us know! Review of the basics of this economical software with an emphasis on the additions that you can make. If you are thinking about adding a software program to your embroidery but don't want a larger investment--take a look at this one. If you are new to this program you will be welcome in this class. 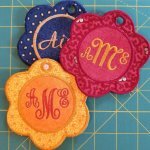 Continue the adventure of machine embroidery with more techniques--this workshop class will stitch up lace, applique, more lettering programming plus work with more placement skills for any machine. Brand New Here--Do you have a Singer Featherweight 221? Would you like to learn more about this perfect portable machine and how to keep it in good working condition? If the answer is yes, then you'll want to attend our first Featherweight function on Friday, May 10th at 6:00. Bring your machine and Doug will walk us through the basic maintenance techniques. You will learn how to care for your featherweight so it can sew up some fun projects as we plan regular meetings--mark your calendars and get signed up!! No charge for this first gathering!! We try our best to offer classes for many of our machines, and offer free group classes for those purchased here in several categories. If you have questions about your machine, please take a look at the basic classes offered or call the store for help. Machine owners who did not purchase here may pay to take these classes-ask about pricing. Premier Embroidery Club meets once a month to enhance your use of software with so many capabilities. The new Viking Premier Plus 2 Software will be used in this class, with limited support of Premier Plus continuing. If you have Embroidery or Embroidery Extra the teacher will need to know well before the class to ensure the lesson can be done on your level. We are going strong after our January start--but you can join us at any time! We do a monthly "Friendship Quilt" block (with some tutorials), plus exchange and mystery programs, and small challenges some months. Our plans will include many opportunities to learn and share as we go along. The "Show and Tell" projects are just wonderful--we have such talented folks--or you are welcome to just come and enjoy the fellowship. We support Safe Haven with monthly donations and also encourage Linus and Cook's fabric donations. We meet on a Thursday evening at 6:30 and Friday at 1:00--usually the third week of the month, but check the calendar for dates!! Everyone welcome!! We go over all of the settings, adjustments and parts, and then cut several different media, and learn to scan for cutting. NOTE!! This class is a prerequisite for other Scan 'N Cut Classes! Class will use all of the rulers in the sampler set as you learn and practice Clamshells, spiral and rotating designs, arcs and more. 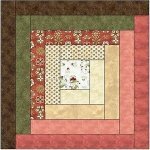 You will also learn how helpful the crosshair square rulers are for your projects.